The P1R Peacekeeper arrives in a SureFire retail box with the model number and specifications clearly labeled on the outside and the light and accessories packaged neatly inside. In addition to the light itself, the package contains a rechargeable lithium-ion battery (installed in light) and battery charger along with AC and DC power cords. Both versions of the Peacekeeper feature all-aluminum body construction, black hard-anodized finish and are very similar in appearance. Externally they are nearly identical aside from the tailcaps, the names engraved on the side, and a “witness mark” on the body of the Tactical version that is not present on the regular Peacekeeper. The 1” diameter body is reminiscent of the classic “4 flats” design of some older SureFire lights. Two sides are completely flat while the two sides with lettering are slightly curved. The corners where the sides join are radiused and covered with knurling to improve grip. All lettering is crisp and legible. The bezel measures 1.37” in diameter and has 6 shallow crenellations around its perimeter. The base of the head is wider and has six flat areas to help prevent the light from rolling when placed on a flat surface. 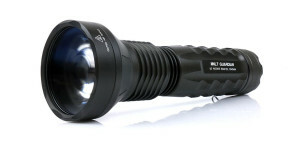 The business end of the Peacekeeper houses the Cree XM-L2 emitter and its textured reflector. The tempered window has anti-reflective coating to allow the maximum amount of light to get downrange. Both tailcaps have raised ridges, in lieu of knurling, along their length for added grip. The click-type tailcap (below left) is the longer of the two and partially shrouds the rubber switch boot. The switch is easy to operate in momentary-only mode and requires substantial travel to activate constant-on operation. This feature, combined with the partial shroud, helps reduce the possibility of inadvertently triggering constant-on output. In contrast, the tactical style tailcap switch (below right) requires firm pressure and very little travel to activate momentary output. Both tailcaps can be “locked out” to prevent inadvertent operation by loosening (unscrewing) them ½ to ¾ turns. As a result of the different tailcaps the regular Peacekeeper is about 1/8” longer than the Peacekeeper Tactical. There is very little difference in height between the Peacekeepers, the 6PX and P2X Fury. The rechargeable battery is loaded from the tail where an O-ring is used to maintain a weather tight seal. The battery compartment measures 18.8mm in diameter and allows the SureFire 18650 rechargeable battery to fit with room to spare. A small spring at the head of the light helps ensure reliable electrical contact with the battery during hard use. The included SureFire branded 18650 2600mAh battery has a raised button at the positive terminal. The battery arrives with only a partial charge (measuring 3.7-3.8 volts) and will require charging before use. The SureFire battery charger may be powered from a 100-240VAC wall plug or 12-24VDC vehicle system and has two charging bays, each with its own circuit capable of providing a 500mA charge current at 4.2 volts. Spring-loaded sliders adjust for the length of the battery and hold it in place while charging. Operational status of the charger is indicated via 2 LEDs, one for each charging bay. When a battery with less than 90% charge remaining is placed in the bay and begins charging, the LED will turn red. If the bay is open, the battery is inserted backwards, or the battery has more than 90% charge, the LED will remain green. Once the battery reaches 90% charge the LED will turn green although charging will continue until it reaches full charge. Charging time will vary according to how far the battery is depleted. Routine charging of a moderately depleted battery should typically take on the order of 2 to 4 hours but recharging a fully depleted battery may require up to 6.5 hours. Dimensionally the P1R Peacekeeper is similar to several existing SureFire lights. This is fortunate for owners of some of these lights as many of their accessories can be put to use with the Peacekeeper. With its 1” body and compact design, the Peacekeeper can be used with several existing holsters designed for use with the 6P, 6PX and 9P. The V91 Quick-Detach holster provides the best overall fit among the nylon holsters. The V10 holster is designed for the longer 9P and, although it will work, is longer than needed for the Peacekeeper. The V20, V21, and V25 holsters will also work although their flaps are just barely long enough to secure the light. Open top leather holsters that are compatible with the 6P, such as the V26 and V27 work well. Speed holsters such as the V70, V85, and V85A may be used but are limited to bezel-up carry with the Peacekeeper due to its larger bezel. The P1R Peacekeeper has the same tailcap threads as all other 1″ SureFire lights allowing it to use the same tailcaps as the 6P, 6PX, and several others. The 1.37″ bezel of the Peacekeeper allows it to share the FM44 Diffuser and FM45, FM46, and FM47 filters with the P2X/P3X Fury and several weapon lights. Grip enhancement aids such as the SureFire Combat Rings and THYRM SwitchBack are also fully compatible. Take a powerful lithium-ion battery and hook it up to the big Cree XM-L2 emitter and you know some good things are going to happen. The Peacekeeper produces a powerful beam with a clearly defined hotspot, slightly broader corona and fairly broad spill beam. Beam tint is typical for the cool white XM-L2 with a creamy white center hotspot, a touch of yellow/green in the corona, and a noticeably cooler spill beam. The textured reflector does a good job of smoothing the beam and there are no signs of rings or artifacts in the main portion of the beam. The following slides show the P1R Peacekeeper compared to a variety of other lights to give some perspective with regard to output, beam profile, and beam tint. The images can be compared across their full widths using the slider and additional comparisons can be viewed by using the navigation buttons in the bottom-right corner of each image. Runtime tests of the high output mode were conducted using the provided SureFire rechargeable battery and Battery Station CR123 lithium primary batteries. When powered by the SureFire 18650 battery, the Peacekeeper exhibited a gradual decline in output but maintained 75% of its initial output for over one hour. At this point output began to decline more rapidly reaching 10% after 1 hour and 45 minutes of total runtime. With the Battery Station CR123 batteries, output began at the same level but dropped rapidly after 9 minutes to about 70% output. For the next 45 minutes the output fluctuated somewhat due to what appeared to be thermal regulation as the CR123 batteries were beginning to heat up under load. This was followed by a smooth decline in output, reaching 10% after 84 minutes of total runtime. When operated continuously the Peacekeeper becomes quite warm but never became too hot to hold. In all tests the bezel temperature rose to approximately 118° Fahrenheit and stayed close to that level while the light was in regulation. Normal intermittent usage would result in a greater percentage of time at the highest output levels and a corresponding reduction in cumulative runtime. The SureFire P1R Peacekeeper is a very solid compact light that simply feels great in the hand. With the big 18650 battery installed, the Peacekeeper is still a little bit front heavy which is an indication of just how much aluminum there is in the bezel to provide heatsinking for the XM-L2 emitter. Everything about the light feels solid and even though the battery compartment is oversized to accommodate the rechargeable battery, the head and tail springs hold the batteries tight enough that there is a minimal amount of battery rattle. The only defect I could find on either light was a tiny pinprick in the anodized finish of the Peacekeeper Tactical. The tailcap threading on both lights felt very tight when first taken out of the box but a tiny bit of grease on the tailcap O-rings made all the difference in the world. In contrast to the 6PX and Fury, I am pleased to see the knurling on the Peacekeeper. The flat sides, being slightly recessed, result in a small ridge between the body and tailcap which also helps with grip. It’s no combat grip but it is enough to make the light very stable in overhand, underhand, or cigar holds. As with the 6PX and P2X Fury, the short body means users with large hands will probably have at least one finger resting on the head when using an overhand grip. The regular Peacekeeper has been reliable and consistent in mode changes and no amount of shaking, beating, or rapid clicking caused it to skip a mode. If anything, the mode reset time seems shorter than the specified two seconds. I can’t reliably time my clicks with any degree of accuracy but it feels like it’s more than one second but less than two. The Peacekeeper Tactical has also worked reliably although not as smoothly as the dual mode version. The 18650 battery is just slightly longer than two CR123 batteries which makes the switch more difficult to hold in momentary mode. Also, when the tailcap is fully tightened for constant-on operation and then loosened to turn the light off, the tailcap spring is so stiff that it causes the battery to rotate against the spring at the head. While this doesn’t really affect operation, it causes the springs to bind as they “wind up” and release as the tailcap is unscrewed. Unfortunately, it’s the battery that suffers the most as the exposed end of the tailcap spring digs into the battery’s negative terminal. This is nothing new as SureFire tactical tailcaps have always had this tendency but disposable batteries are simply replaced before the damage to the negative terminal becomes an issue. However, considering the lifespan of a lithium-ion battery and the number of times it will be removed, recharged, and replaced it seems like a better spring or contact design could help reduce wear. The move to the more powerful 18650 lithium-ion battery provides a huge advantage in performance and the ready availability of affordable 18650 cells allows users to obtain spares at minimal cost. Quality matters, as with anything else, and new users should avoid the temptation to choose their batteries based solely upon price. The 500mAh charge current utilized by the included charger is a bit low when compared to the typical charge rates for 18650 batteries but it’s likely good enough for most users who will only require an few hours to keep their battery (or batteries) topped off. I have been keeping an eye on the evolution of the Peacekeeper since it was first announced in 2013 as a 700 lumen “no frills version of the R1 Lawman.” One year later in the 2014 SureFire Catalog it received an “upgrade” and was projected to have its output increased to a whopping 800 lumens. I’m a flashlight junkie and I love lumens as much as the next guy but I am pleased to see the Peacekeeper released with a slightly more realistic 600 lumen output. When you look at today’s flashlight market, it’s all too easy to get caught up in the lumens race and shoot for the gaudy numbers that the light can only sustain for a few minutes. I think SureFire made the right choice and has a winner with the P1R Peacekeeper. Visit the SureFire website for more information about the P1R Peacekeeper. The CR123 batteries used in the runtime test were provided by the kind folks at Battery Station. Their support has been invaluable. 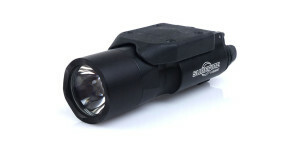 Posted in Flashlight Reviews, SureFire Reviews and tagged LED Flashlight Reviews, Rechargeable Flashlights, Surefire. Thank you for the review Jim, I bought the P1R tactical switch, I will make attention for the spring of the tailcap on the battery during its use. I’ll try with an AW protected 18650 2600mAh flathead. How does the beam pattern compare to the stinger hl? I am looking for something that is more floody?